An active member of the invitation only Bulls Business Community and the Business Honors Program, Gabriela Garcia says she did not come to USF to simply get a degree, she came to transform herself into a professional who leaves her mark on the university, and make life better for herself and others in the process. Garcia credits the BBC’s frequent networking opportunities and improve sessions for her understanding on how to work in a team and what it means to be a professional. A summer abroad experience with the Business Honors Program helped her better understand cultural differences and the importance of cultural literacy in international businesses. But the most important lesson she has learned, she says, is to say “yes” more often. Doing so has led her to leadership positions she never expected to hold. For the USF Residence Hall Association, she was a senator, director of programming, and then president, a position she currently holds. Garcia became a member of Gamma Phi Beta sorority and now serves as a member of its leadership team. These leadership roles have allowed her to meet the goal she set before she got here: to leave her mark on USF. Garcia said such engagement is as important to her as her coursework but one can’t overlook her academic success. She has a 3.91 GPA and her name has appeared on the dean’s list every semester that she has been at USF. 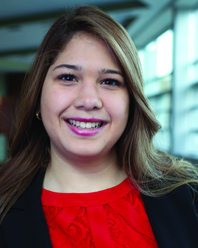 In 2014, Garcia received the Exceptional Scholars Award from the Business Honors Program. Always proud! Siempre excedes mis expectativas. Te amo! I have witnessed Gabriela grow in so many ways thru the years. The enthusiasm, thoroughness and balance with which she tackles the challenges and opportunities is a very distinct trait of her. Congratulations and good luck! I’m sure that you’ll be a winner. You have come so far, and so fast! Since I’ve known you you have always made your way to achieve incredible things, making positive changes in your life in others… You have a such a bright future, keep taking chances and “keep moving forward”! You deserve it! Que orgullo Gaby!! Te mereces lo mejor! The path you selected as your journey has been a picture of who you really are. Succes is with you. She is professional and good person. Por su esfuerzo y dedicación. Saludos desde España. this is only at 20! Brilliant future. Excellent young woman, smart, proactive and big heart. Kids follow the family example of life. Her actitude its s perfect example. I consider that Gabriela deserves this honor due to her leadership skills, work capacity and compromise with her classmates. I’ve had the pleasure and honor to have Gabriela as student. Intelligent, smart, awesome personality and a caring human being. She’s a bright young lady. Excellence at the highest level !!! Excellence at the highest level. She is the best candidate for this prize. Gabriela comes from an excellent family which I am honoured to know, and She will be as great as she deserves and want to be. Congrats from now Gaby, you are the best! I had known Gabriela since she was in 8th grade and had always been an exeptional student. I think Gaby Garcia is a very dedicated and competitve in every thing she does. Segurísima de que ganaras gaby, sigue asi cosechando triunfos!!! The perfect choice. Excellent Professional!!! Gaby Garcia is mature ,capable, smart, motivated,dedicated as well as respectfull person.I all my confidence on her. Gaby is a exelent candidate! Gabriela will be the best! Felicidades!! Que sigas cosechando éxitos. Way to go girl! The sky is the limit! Congratulations to all the selected students, and especially to Gabriela. Great statement! May you continue to succeed in life! Gaby muy orgullosos de ti!!! Superb choice! Good luck in all you do!! You’re road to success is already paved! Dear Gabby, I am very proud of your success, continue moving forward in your career. Congratulations!!! Estamos muy orgullosos de ti Gaby!!! Gaby, I’m rooting for you. You deserve to win. All my love. Excellent!! Keep up the good work and youll success ⭐️ congratulations !! excellent. Keep up the good work and you will succeed in life⭐️ Congratulations !! Felicidades Gabriela y por supuesto extensivas a tus padres. Un abrazo a todos! Good luck Gabriela, God help you all the time. So proud of you Gabriela…………..God bless you all the way. Best Wishes and good luck! The apples don’t fall far from the trees. Felicidades! De ti no se esperaba menos. Diod te bendiga.